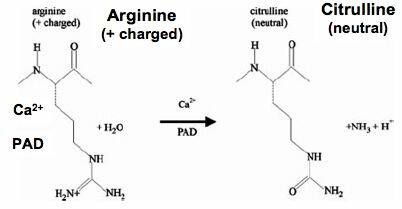 L’ artrite reumatoide (RA) è una malattia autoimmune sistemica con andamento cronico e con carattere di aggressività. Sebbene la RA sia caratterizzata da infiammazione cronica con interessamento sistemico, la malattia presenta una elettiva localizzazione poliarticolare ed è frequentemente responsabile di grave disabilità. B, Constitutional symptoms and signs. Constitutional symptoms and signs can vary with disease activity. 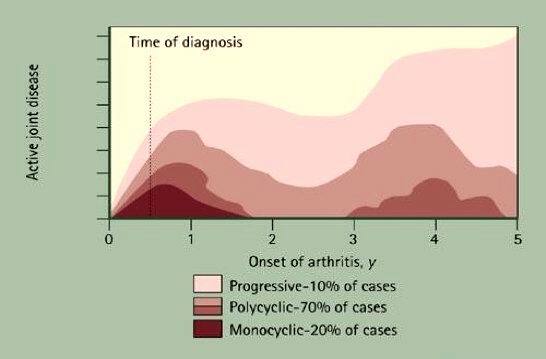 Most patients with active arthritis experience more than 1 hour of morning stiffness. Ai fini diagnostici occorre la presenza di almeno 4 criteri su 7. I criteri 1 e 4 devono essere presenti per almeno 6 settimane. I suddetti paramentri di laboratorio sono non specifici e riflettono sia lo stato di flogosi acuta che cronica, e in talune condizioni possono non essere correlate con la malattia. 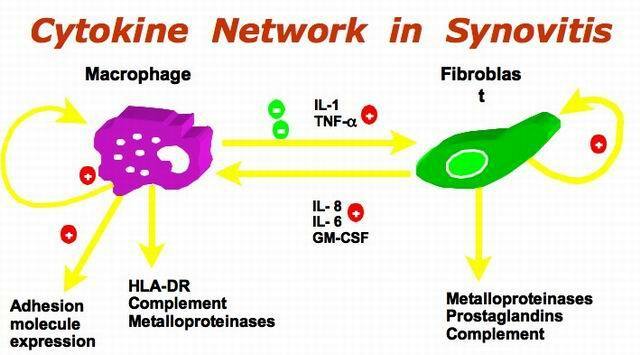 Cytokines involved are: GM-CSF, IFN-γ, IL-1β, IL-6, IL-8, IL-10, IL-12, IL-15, IL-2, IL-17, TGF-β, TNF-α. 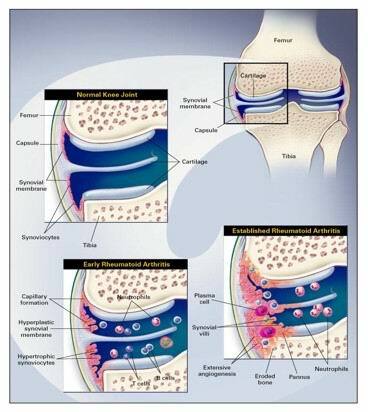 Early cartilage and bone erosion in rheumatoid arthritis is associated with the accumulation of several cell populations in the synovial membrane and the formation of a proliferating pannus. The synovial sublining layer contains several cell populations including macrophages, T and B lymphocytes, dendritic cells, and polymorphonuclear leukocytes. The lining layer contains large numbers of macrophages and fibroblast like synoviocytes. The interface between pannus and cartilage is occupied pre dominantly by activated macrophage populations and synoviocytes capable of secreting cytokines and destructive proteases in abundance. 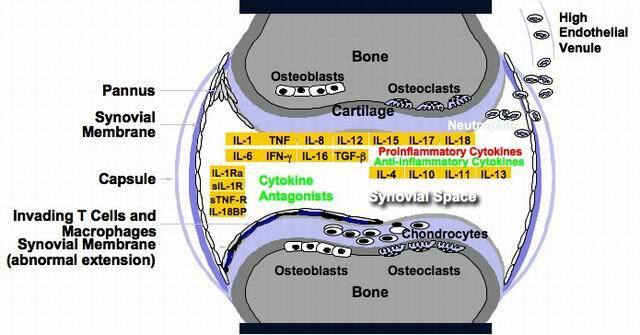 (Bresnihan B. Pathogenesis of joint damage in rheumatoid arthritis. J Rheumatol. 1999;26:717-719). 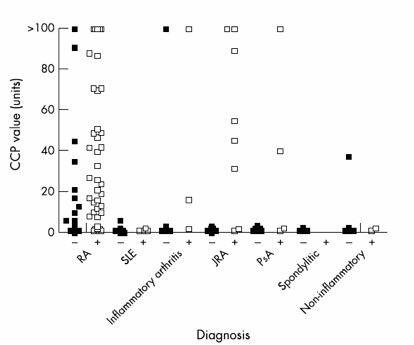 The greater production of IL-1 by rheumatoid synovium, in comparison with that from patients with osteoarthritis, may be due primarily to the greater numbers of macrophages and higher degree of vascularity of rheumatoid tissue. (Farahat MN, Yanni G, Poston R, Panayi GS. 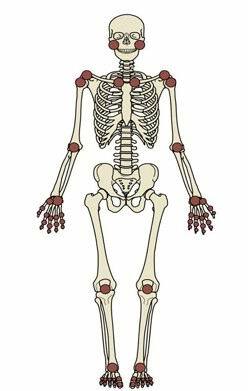 Cytokine expression in synovial membranes of patients with rheumatoid arthritis and osteoarthritis. Ann Rheum Dis. 1993;52:870-875). 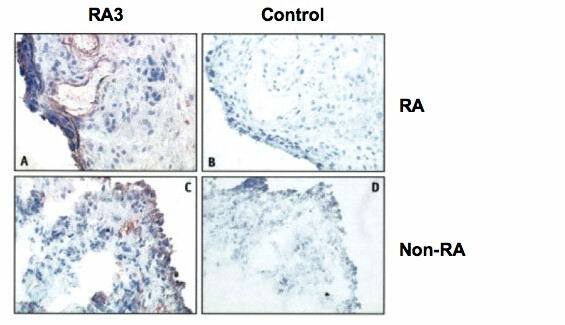 These results all suggest that IL-1 production is abundant in synovial macrophages, and may be associated with a more active destructive stage of rheumatoid synovitis. Proinflammatory cytokines, shown above the dotted line, include interleukin-8, tumor necrosis factor-alpha (TNF-α), interleukin-17, interleukin-18, and interleukin-1. 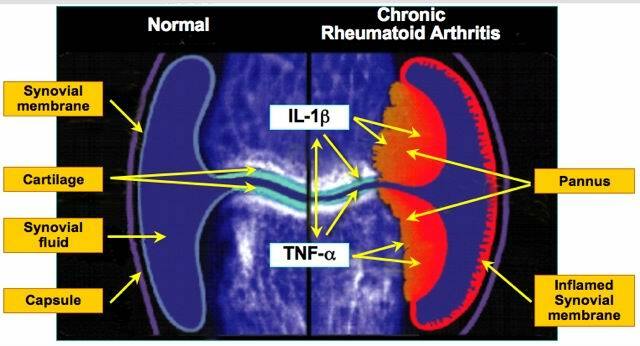 Although more than a dozen cytokines are believed to be involved in rheumatoid arthritis, IL-1 and TNF-α are thought to play central roles in the pathogenesis of the disease. A listing of the inflammatory effects of IL-1 and TNF-α demonstrates the degree to which their effects are shared. In addition, IL-1 is able to induce the expression of TNF-α, and vice versa, providing further evidence of their functional interrelationship in the pathogenesis of rheumatoid arthritis. Although overlapping, their effects are not identical. 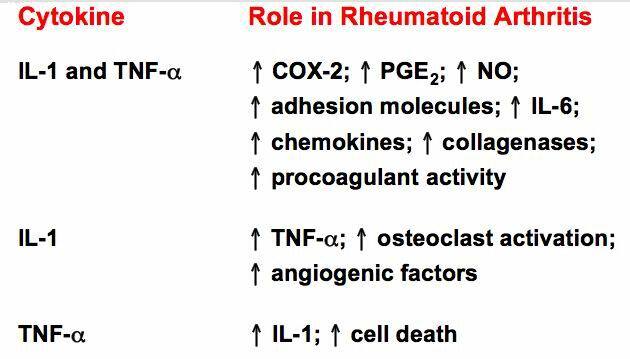 IL-1 has been particularly associated with osteoclast activation and upregulation of angiogenic factors, which may contribute to the bone and cartilage destruction and neovascularization seen in rheumatoid arthritis. TNF-α has been particularly associated with induction of apoptosis, or programmed cell death. 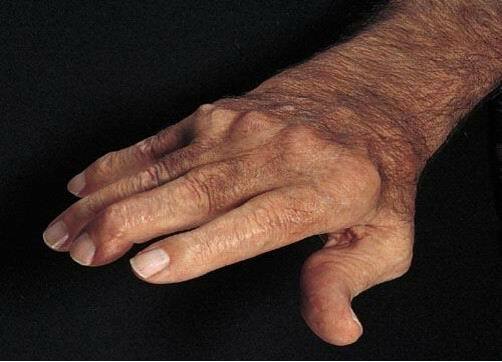 The current treatment options for RA are multifocal. First, nonsteroidal anti-inflammatory drugs are commonly used. In addition, we often use corticosteroids, such as low-dose prednisone, which are often used as bridge therapy or to allow treatment for acute flares. In addition, there are a variety of other more potent, so-called disease-modifying drugs including methotrexate, hydroxychloroquine, sulfasalazine, leflunomide, and others. 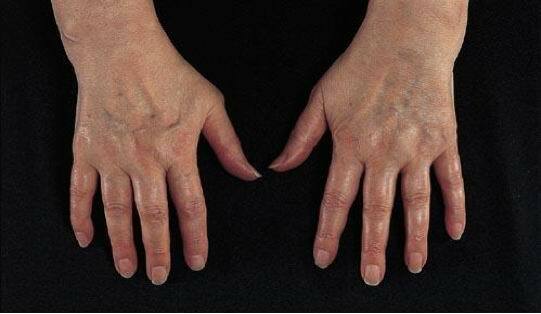 In the past 5 to 6 years, there have been biologic modifiers, or biologic disease-modifying drugs, approved. 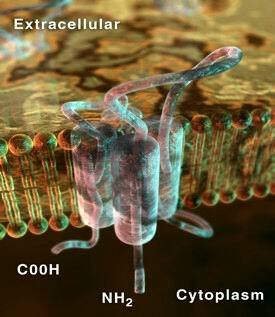 Moreover, in the past few years, clinicians have learned that the combination of biologic disease-modifying drugs with some of the synthetic disease-modifying drugs has added benefit and may provide more complete response than either synthetic disease-modifying antirheumatic drugs (DMARDs) or biologic DMARDs when used as monotherapy. Gli obiettivi principali della terapia dell’AR sono: la riduzione dei sintomi dipendenti dalla infiammazione, quali il dolore, la tumefazione articolare e la rigidità; il miglioramento/ripristino della capacità a svolgere ogni funzione; il ritardare o bloccare l’evoluzione del danno anatomico alle articolazioni. Ciò significa puntare ad un obiettivo ambizioso: la remissione (che significa guarigione di una malattia di cui non si conosce la causa che non può quindi essere eliminata). L’abolizione dell’infiammazione può ripristinare una sopravvivenza paragonabile a quella della popolazione sana. 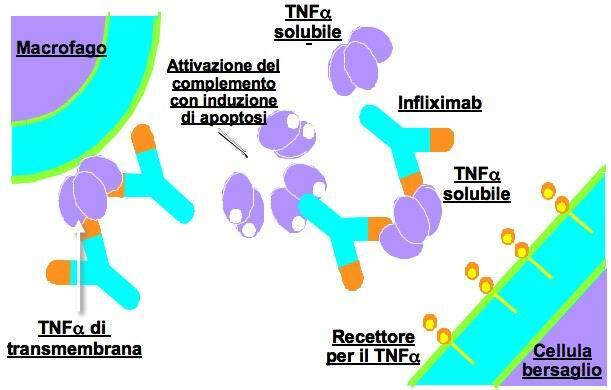 In general, the TNF inhibitors have been shown to be fairly safe in clinical trials. However, some issues have developed at the postmarketing stage that clinicians need to be aware of as they see patients and advise them about these drugs. Infliximab is an agent that is given IV, and infusion reactions have been reported. Although they have been rare, serious, life-threatening anaphylactic reactions may occur. 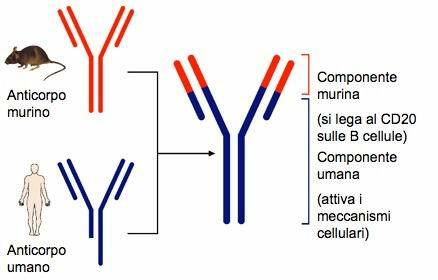 Injection-site reactions, again, are not a serious problem, but they are commonly reported with adalimumab and etanercept; they usually do not result in the need to discontinue the use of the drug. Common infectious complications, such as upper respiratory tract infections, sinus congestion, or infections, have been reported and are easily managed in those patients; however, there have been data published with postmarketing information that opportunistic infections and tuberculosis can be an issue with the TNF inhibitors. It is thus important to carefully screen patients by performing a purified protein derivative (PPD) skin test and chest X-ray prior to starting these drugs to make sure there is no active infection. Less common are drug-induced lupus-like syndrome, demyelinating disorders, and malignancies. These issues continue to be an area of research and need to be resolved with appropriate databases to determine if they are problems that may be part of the RA clinical spectrum or if the TNF inhibitors actually increase the risk of these side effects. 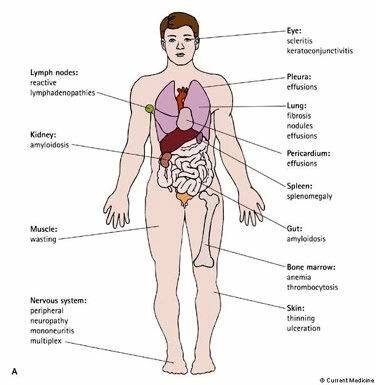 Finally, some of these agents may be associated with the appearance of human antichimeric antibodies (HACAs), antibodies that develop against the TNF protein that has been administered. 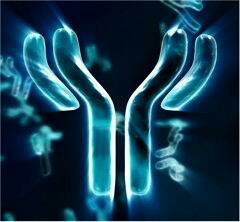 To date, there is very little data published about the clinical significance of these antibodies. The safety profile with anakinra has been generally positive. Some patients develop injection site reactions. Infectious complications, although not severe, have been reported, including upper respiratory tract infections. 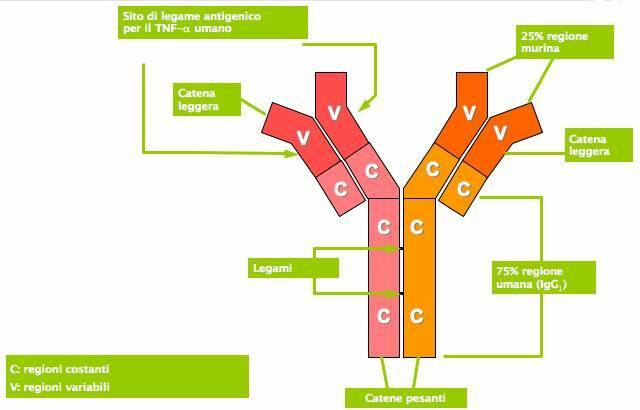 More recently, a study published in Arthritis and Rheumatism by Genovese and colleagues has shown that anakinra, when used in combination with etanercept, increases the risk for serious adverse events, and the combination of anakinra with a TNF inhibitor is no longer indicated based on the safety profile as well as data demonstrating that the combination was not more effective in suppressing the disease activity. 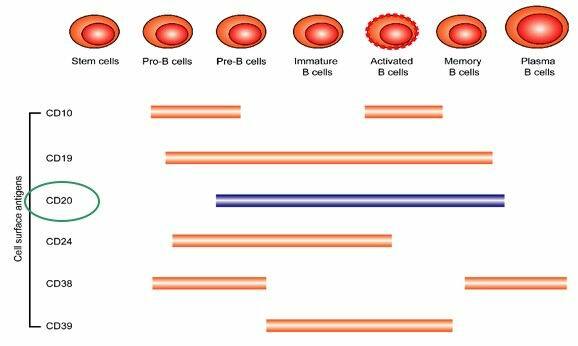 Although not a major issue, neutropenia has been reported in the clinical trials, especially in combination with the TNF inhibitors. 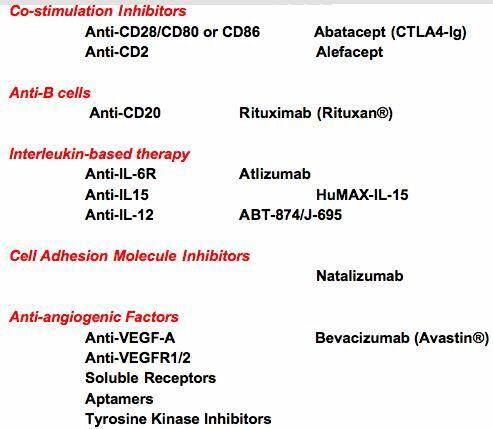 This has been reversible when the TNF inhibitor and the IL-1 blockers were stopped. 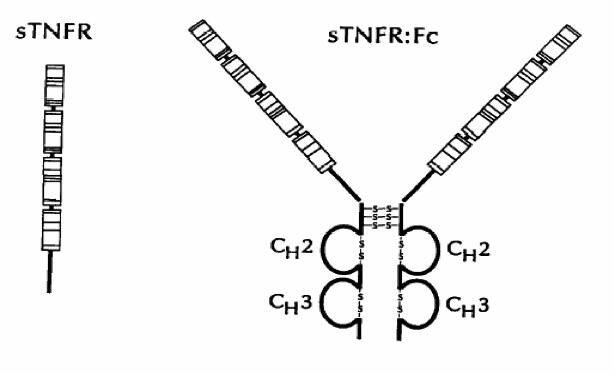 As with the TNF inhibitors, there is also the potential of developing antibodies to anakinra, but again, these are felt not to be of major clinical significance. 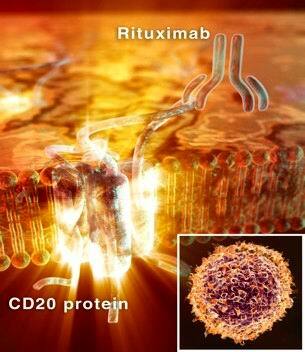 Of course, much more work needs to be done in order to understand the true significance and clinical consequences of antibodies to all of the biologic response modifiers.